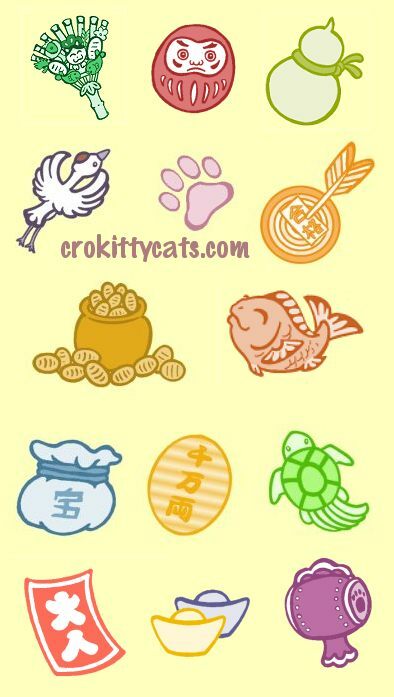 On this page you'll find one of the stories of the Maneki Neko as well as an explanation of their symbols and accessories (which decorate the background used on this website). The latter is at the bottom of the page. "Nihon wa...Edojidai ni...hijou ni mazushii biku to hijou ni mazushii neko wa hijou ni mazushii jinja ni tsundeita." In Japan, during the Edo era, there was a very poor priest and his very poor cat in their very poor temple. The priest had no money for the upkeep of the temple, nor did he have any food to fill his belly. Even the mice were starving and were no meal for his cat Tama-chan. Tama-chan was a good little cat and felt terrible for the priest's worrying so. As she pondered what a simple cat like her could do to help, a storm rose up and showered rain fiercely upon the land. Naotaka-sama, a very wealthy man, was traveling when the rain ushered forth. So he hid beneath one of the Sakura trees on the temple grounds. Tama-chan noticed him resting there, and began calling out to him. "Nya nya nya!" But Naotaka-sama could not hear her over the pounding raindrops. Tama-chan felt her hair grow bristly and knew she had to try harder. She cried again, louder, and waved her paw to call him over. Her waving paw drew his attention, and as he joined her on the temple steps, lightning struck the Sakura tree he'd been standing under. He chose to thank Tama-chan and the priest by making their poor little temple his family temple. It was renamed Gotokuji (Gotoku Shrine) in his honour. This is my favourite of the many Maneki Neko or Beckoning Cat legends. The opening lines in Japanese are from a short one-act table-top puppet play I performed in 2003. Gotokuji does actually exist in the city of Setagaya. You can learn more by visiting the city's English page here. Depending on colour, design, raised paw, body position, etc, Maneki Neko beckon for all sorts of things. Most commonly you will see them inviting fortune, luck, or customers. They have also managed to become an icon in both Japanese and Chinese culture. This was created solely for the purpose of this website. The crane, tortoise, money sack, and hammer were based on the embroidered images on Marl, my dancing matsuri neko. The koban coin and pot of coins were redrawn from lucky cat stickers I bought. The rest of the images are original designs by me. All of these items have been associated with lucky cats. Daruma This figure is based on the story of a Buddhist monk who meditated for so long he lost his arms and legs. When you get one, you paint in one eye and make a wish. If the wish comes true, you fill in his other eye. Hyoutan lucky gourd; used throughout the world as a container or flask. In Japan they have come to be associated with success and happiness, as seeds stored in these containers always bloomed successfully. Thanks to the Hyotan Bulletin for the info! Tsuru crane; fabled to live for a thousand years, the crane is a symbol of longevity and good fortune. Hama-ya sacred arrow; thought to possess divine powers as a bow could ward off your enemies from a great distance. Over the years the arrow has become a gook luck totem often purchased at Shinto shrines. The kanji on the paper reads "goukaku" and means 'success in passing a test' Thanks to the Hyotan Bulletin for info! Tai Fish sea bream; a symbol of good fortune as it is almost always depicted with its captor, the god Ebisu. Ebisu is one of the Seven Lucky Gods (or Shichifukujin), is the god of fishermen and wealth, and is the only of the seven gods to have originated in Japan. Koban an old Japanese coin from the Edo period. The coin the Maneki Neko carry is worth ten million times the actual coin used. Sometimes a Neko's Koban will feature words of good fortune rather than monetary amounts. Daikoku's Hammer a lucky mallet carried by Daikoku (or Daikokuten) one of the Seven Lucky Gods (Shichifukujin) and often seen as Ebisu's buddy. Daikoku is a god of bounty, as his mallet can bring forth riches when it strikes. He and Ebisu are well loved aong merchants and the working class.